Canon 5d MkII EF 17-40 at 22mm f16 ISO 100 25 sec. Just when you think you have it all figured out… Sometimes it just goes wrong. 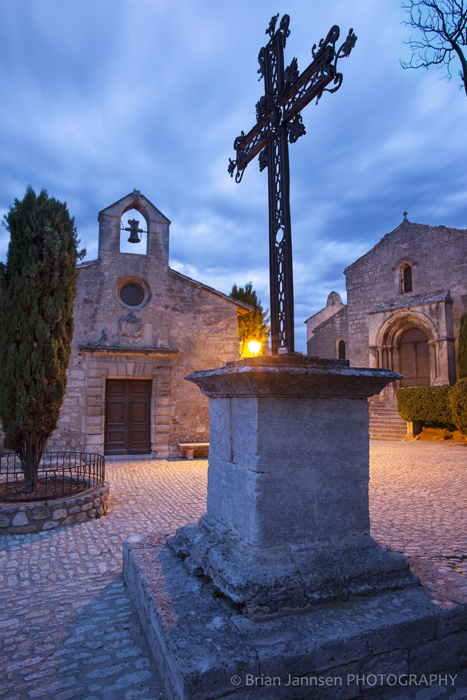 I was planning a twilight shoot across the valley from this wonderful medieval town – Les Baux de-Provence. I had mapped it, studied the angles and new the exact moment of sunset and twilight. I arrived at the trail head with plenty of time to make the 1 1/2 mile hike to my chosen spot. Everything seemed perfect. Oops – it turns out that the trail I was hiking on wasn’t the one I was supposed to be hiking on. After wandering around for about 45 minutes I decided I needed to make something out of the evening so I gave up on the hike and headed directly into town. I walked past the touristy restaurants near the entrance and headed toward the end of town. With no one around – except for a stray dog that took a liking to me, I rounded this corner and saw the shot. In about 30 minutes I had made a number of images from this little corner of town – some very interesting ones, but this one is my current favorite. Sometimes you have to give up on the immediate plan in order to find something that may in fact turn out to be better than you would have imagined. Now where’s that trail I need to be on?